Essential, sporty, hi-tech but - most importantly - fun. In one word: Monster. With its supremely sporty performance and agility, the Monster 821 has been designed for maximum riding pleasure. The performance of the 109 HP Testastretta 11° engine is enhanced by the Ducati Safety Pack (ABS and Ducati Traction Control) and the Riding Modes, which guarantee maximum safety always and everywhere. In addition, the Quick-shift up & down system is available as an accessory. The TFT color display provides the rider with all of the necessary information at any time. Over the last 25 years, we've never got tired of telling the Monster story. A story made of passion and innovation that has been written together with thousands of people who continue choosing it. TANK, SEAT AND TAIL: Tank and tail have been completely redesigned and are now visually agile and slim, while retaining the muscular and aggressive shapes that are key elements of the Monster's DNA. 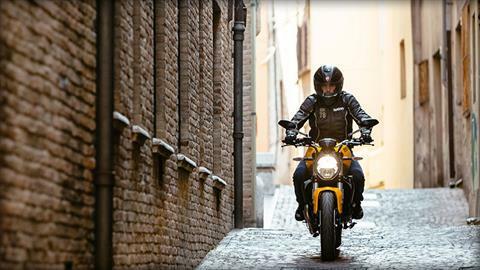 The 16.5 l tank is common to the Monster 1200 and guarantees a long ride. The twin-seater tail with a removable passenger seat cover incorporates the number plate holder. The ergonomics can be adjusted thanks to the seat that can be set to two different heights from the ground (785 mm - 810 mm) so that riders of different stature can always have a correct riding position. The ergonomics also benefits from rider and passenger footpeg supports, which are now separate. FRAME AND SUBFRAME: The Monster 821 has a structure with a load-bearing engine and the main trellis frame attached to the twin-cylinder heads. 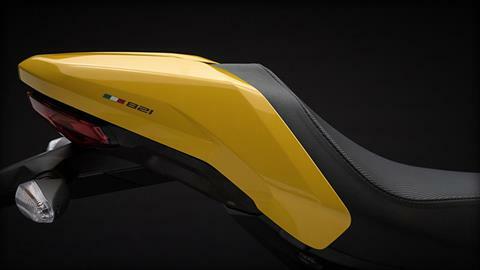 The concept is derived from racing and was applied for the first time to a production bike with the Panigale project. This configuration allows for a very compact, lightweight frame, and, thanks to tubes with a large cross-section, also a high torsional rigidity, perfect for bringing out the dynamic qualities of the vehicle. The double-sided swinging arm of the Monster 821 also guarantees a compact 1480 mm wheelbase. The rear subframe seat support, also attached directly to the engine, has been redesigned, creating a compact structure intended to also support the passenger footpeg brackets, separate from those of the rider, to provide greater freedom of movement during sport riding. 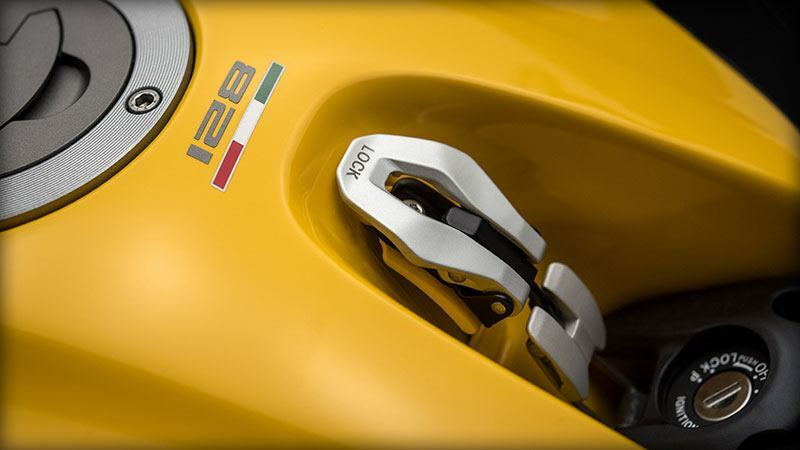 The attachments for rider and passenger footpegs are made of cast aluminum and are fitted with aluminum footpegs. 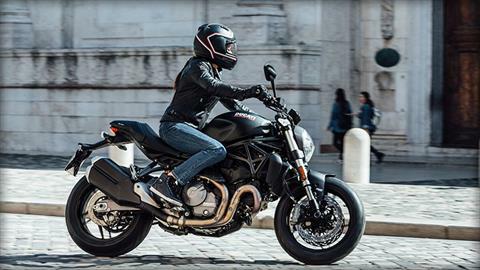 The rider footpegs are completed with an aluminum heel guard, underlining the sporty soul of the Monster 821. BREMBO BRAKING SYSTEM: The Monster 821 braking system guarantees high performance and maximum safety in all conditions. On the front the Brembo radially-mounted, 4-piston, M4-32 monobloc brake calipers with axial master cylinder act on 2 semi-floating 320 mm discs, while the rear 2-piston Brembo caliper works on a 245 mm disc. The system comes standard with adjustable ABS Bosch 9.1MP. SUSPENSIONS: The Monster 821 is equipped with a 43 mm diameter front fork and a rear monoshock with spring preload adjustment and hydraulic brake extension that utilizes progressive linkage by fastening directly to the vertical cylinder on one side and the die-cast aluminum double-sided swinging arm. 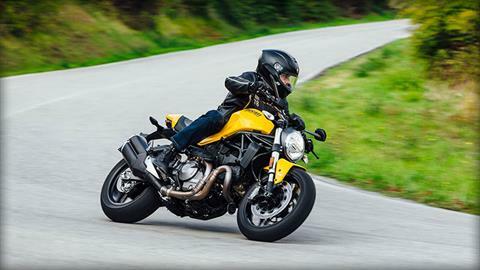 Thanks to a sustained but comfortable calibration of the suspensions and agile chassis dimensions, the Monster 821 ensures great speed during direction changes and a riding pleasure within everyone's reach. TIRES AND RIMS: The Monster 821 is equipped with 10-spoke light alloy rims measuring 3.5 x 17 in. on the front and 5.5 x 17 in. at the rear, mounting a Pirelli Diablo RossoTM III 120/70 tire on the front and 180/55 on the rear. The rear tire is dual compound with high percentages of silica providing grip under all conditions, not only on dry surfaces but also on wet, and all of this results in truly sporty handling. The Pirelli Diablo RossoTM III tires ensure superior, consistent performance over time because their technical characteristics are long lasting and make them enjoyable and fully usable throughout their life. TESTASTRETTA 11°: The Monster 821 is driven by the twin-cylinder Desmodromic Testastretta 11° with a displacement of 821 cm³, designed to be a structural element of the chassis. The engine of the Monster 821 "breathes" through Ride-by-Wire commanded throttle bodies, is Euro 4 approved and ensures a maximum output of 109 hp (79 kW) with 9,250 rpm and a maximum torque of 8.8 kgm (86 Nm) at 7,750 rpm. Developed to ensure a delivery of full and progressive torque at every speed, this engine guarantees fun and usability that are within reach of all. 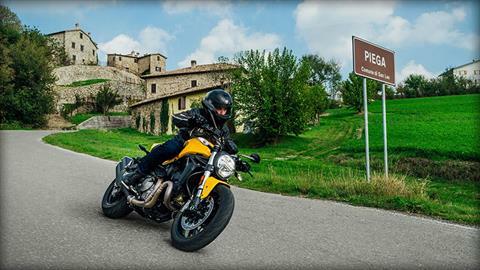 Furthermore, long maintenance intervals calling for the control of valve clearance every 30,000 km make the Monster 821 a reliable and accessible bike. POWER AND TORQUE: With tailor-made and optimized exhaust and intake systems, the Testastretta 11° engine delivers a high power output of 109 hp (79 kW) without sacrificing an extremely favorable torque curve. Both the most demanding racers and urban riders will appreciate the vigorous torque, always available in a wide range of speeds, reaching 85% of its maximum value already at 5000 rpm. The character of the Testastretta 11° is exalted by the choice of the final ratio defined to develop the maximum acceleration and maximum engine response of each gear at every throttle opening. ANTI-HOP CLUTCH: The anti-hop wet clutch on the Monster 821 is cable-driven and requires little effort on the lever. Thanks to a progressive control system, the spring load is automatically increased. The result is a much greater sensitivity of the lever, which guarantees excellent comfort even in the event of frequent gear changes, in city traffic or on long journeys. When the torque on the wheel has an opposite effect, the same mechanism reduces the pressure on the clutch plates, allowing them to work in the anti-hop sport mode that counteracts the destabilization of the rear end during aggressive downshifts while always ensuring safety and control. EXHAUST SYSTEM: The Testastretta 11° 821 engine is coupled with a type 2-1 exhaust system leaving no room for doubt about the performance it can deliver. The primary exhaust ducts, with a 50 mm cross-section, were designed with equal lengths to maximize engine power and efficiency of delivery. The system is equipped with a lambda sensor for each cylinder in order to autonomously and optimally manage the fuel supply. The silencers, combined in an overlapped and fully redesigned configuration, have a catalytic converter to ensure compliance with Euro 4 regulations, while the electronically controlled regulation valve optimizes the exhaust pressure throughout the full range of use. 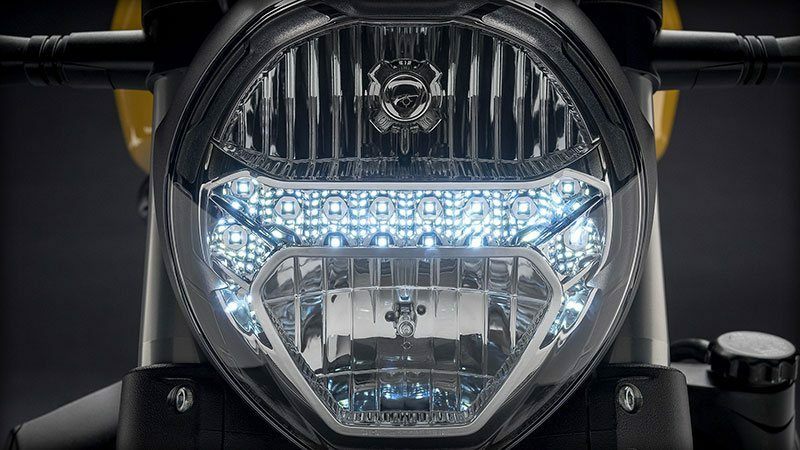 HEADLIGHT: The front headlight of the Monster 821 is modern and contemporary, while recalling the circular shapes that have always characterized the front end of the Monster of each generation. 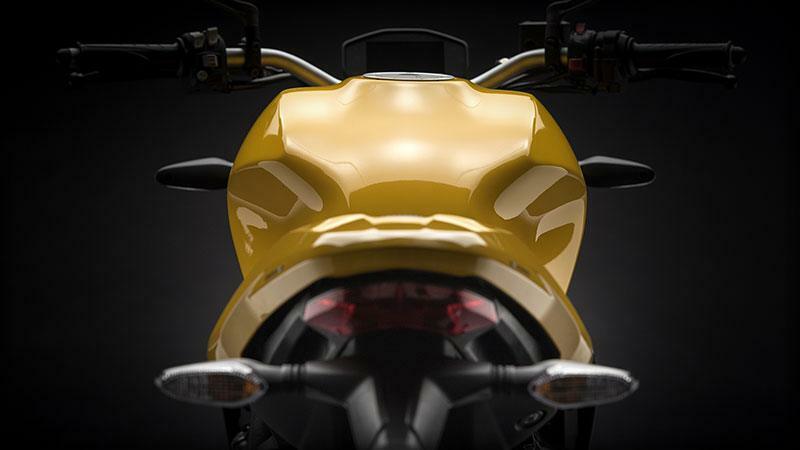 It is also technologically advanced, using a halogen light source with "horseshoe" LED parking lights, a distinctive feature of all Ducati naked bikes. The rear light is also a LED. COLOR TFT INSTURMENT PANEL: The Monster 821 instrument panel features a color TFT display with an indicator of the current gear and fuel level. The display, repositioned to ensure better daytime readability, provides a variety of viewing modes, each designed to show the information that is suited for different situations of use. All modes include the indicator with the current gear. 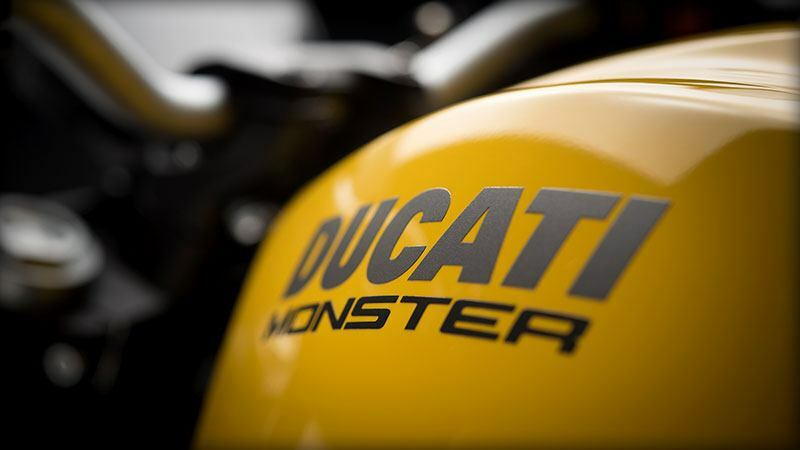 The Monster 821 instrument panel is also designed to display information from the Ducati Multimedia System (DMS), which allows you to connect a smartphone to the bike through the Bluetooth module available as an accessory and to manage some of its functions through buttons on the handlebars. The Monster 821 also has a USB socket under the seat for charging devices like smartphones and so on. DUCATI QUICK SHIFT UP & DOWN (DQS): One of the accessories available for the Monster 821 is the Ducati Quick Shift up/down, an electronic system derived from racing that makes it possible to change gears without the use of the clutch and without closing the throttle when shifting up, and shifting down without using the clutch, but only with a closed throttle. The system consists of a bi-directional microswitch integrated into the gearchange lever linkage that, when used, sends a signal to the engine control unit. The system acts differently depending on the direction of the change, integrating advance ignition and injection during the upshift phase, and controlled throttle opening (automatic "blipping") when the gear pedal is pressed in downshift mode. The magnitude and duration of the solutions are implemented in such a way as to ensure maximum fluidity in various riding conditions. In acceleration, the DQS system saves fractions of a second that would otherwise be lost by closing the accelerator and acting on the clutch lever, and increases stability because the time in which there is no power output is reduced. When downshifting during braking, DQS allows the gears to be easily engaged without having to use the clutch, letting the rider concentrate exclusively on braking and cornering maneuvers. This system not only makes sport riding more enjoyable, but also represents a valuable help in city traffic and winding roads that require frequent gear changes. 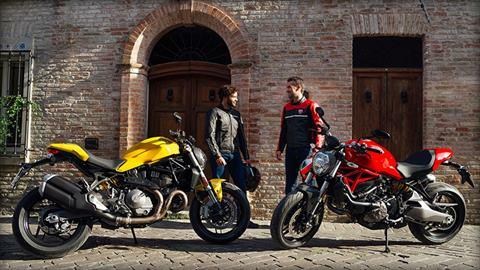 DUCATI SAFETY PACK (DSP): With the Monster 821, performance, riding pleasure and safety are uncompromising. The Ducati Safety Pack, which guarantees a high level of safety for the rider and the passenger in all driving conditions, integrates ABS 9.1MP with 3 levels and Ducati Traction Control (DTC) with 8 different levels. MULTI-LEVEL ABS 9.1MP BOSCH: To guarantee braking that is both robust and safe, the standard Monster 821 is equipped with ABS Bosch 9.1MP braking system with integrated pressure sensor, an integral part of the Ducati Safety Pack (DSP) that combines the most advanced safety with the best braking performance. The system guarantees shorter stopping distances, better stability in any condition and can be adjusted to three different settings. Level 1 of the system adapts the ABS to sport performance and does not activate the rear anti-lifting mechanism, while level 2 offers the same configuration but with moderate anti-lifting action. Finally, level 3 corresponds to the maximum degree of activation, ensuring outstanding braking stability and maximum anti-lifting control of the rear end. 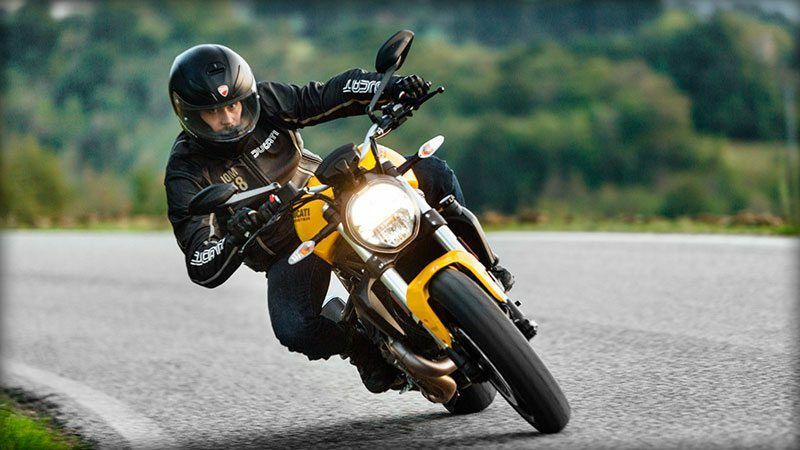 MULTI-LEVEL DUCATI TRACTION CONTROL (DTC): Ducati Traction Control is an intelligent system that acts as a "filter" between the right hand of the rider and the rear tire. 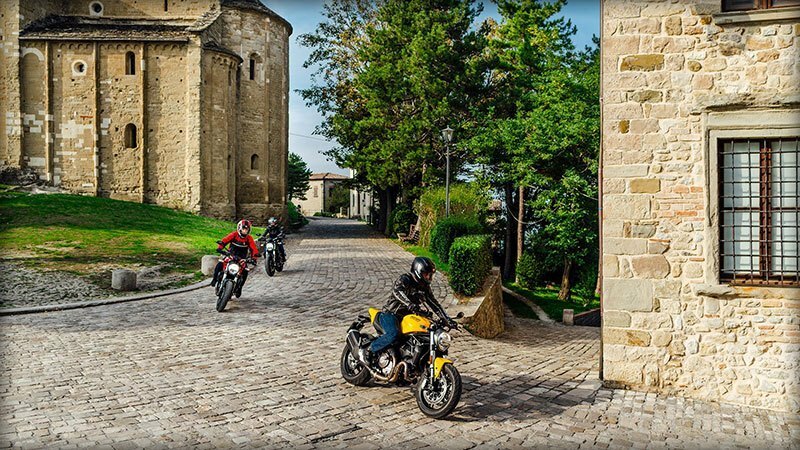 Ducati DTC offers the option of choosing between eight profiles or "sensitivity levels", each of which is programmed with a different slip tolerance value, commensurate with progressive riding levels and ranked from one to eight. When DTC is activated, the control unit analyses the data sent by the rear and front wheel speed sensors, detects the slip value and calculates the type of intervention needed. The intervention is performed with extreme fluidity by electronically inducing a slowdown in engine injection to reduce the torque until rear grip is fully restored. The DTC can also be disabled by the rider. 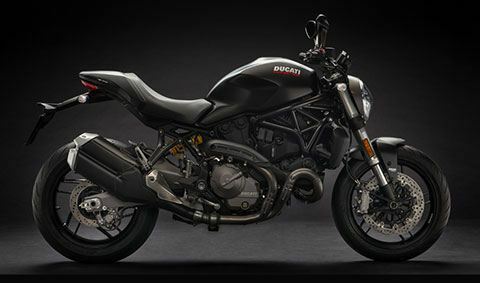 RIDE-BY-WIRE (RbW) AND POWER MODE: The Ride-by-Wire (RbW) system is an electronic interface between the engine and the throttle handgrip, using the innovative Ducati e-Grip system to administer different mappings and adjust power delivery (Power Mode). The throttle handgrip is not equipped with an accelerator cable directly connected to the throttle bodies, but rather sends a signal to the control unit, which in turn electronically commands the opening of the throttle bodies. The RbW system uses three different mappings to adjust the maximum available power and power delivery: 109 hp with sport delivery, 109 hp with progressive delivery, 75 hp with progressive delivery. 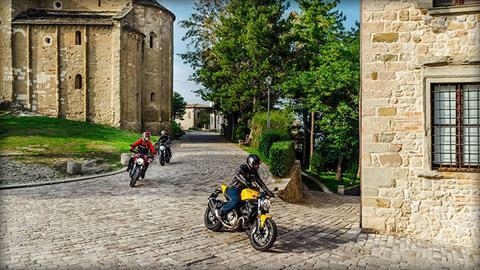 DUCATI RIDING MODE: Ducati Riding Mode allows you to choose from three pre-set modes to optimize the vehicle's behavior based on the rider and the environmental conditions: "Sport", "Touring" and "Urban". Each Riding Mode is programmed to instantly change the ""character"" of the engine (Power Mode) and the ABS and DTC intervention levels even while in movement. Sport Riding Mode: Sport Riding Mode provides 107 hp of maximum power and a delivery with a direct response of the RbW to throttle opening, reduced intervention of the DTC system and level 1 ABS braking efficiency with no rear lift control. Touring Riding Mode: Touring Riding Mode provides 107 hp of maximum power and a delivery with a progressive response of the RbW to throttle opening, greater intervention of the DTC system and level 2 ABS braking efficiency with moderate rear lift control. Urban Riding Mode: Urban Riding Mode provides 75 hp of maximum power and a delivery with a progressive response of the RbW to throttle opening, an even greater intervention of the DTC system and level 3 ABS braking efficiency with maximum braking stability and rear lift control. The Power Modes and ABS and DTC intervention levels can be set independently of each other to create custom riding modes. Rear - 10-spoke light alloy, 5.5 x 17 in. Standard Equipment - Riding Modes, Power Modes, Ducati Safety Pack (Bosch ABS + Ducati Traction Control DTC), Ride-by-Wire, Passenger seat cover, Up&down Quickshift (DQS), Anti-theft system, Ducati Data Analyzer (DDA) ready.